Location: On the west side of Regent Road (A5036) just south of its junction with Sandhills Lane. Notes: Huskisson Dock was situated on the Liverpool Overhead Railway (LOR) and had opened by May 1896 as a replacement for Sandon Dock station which had opened with the line on 6 March 1893. The LOR was an elevated railway that ran throughout the length of the Liverpool dock system. Being sixteen feet above street level the line was worked by electric traction from the start. Huskisson Dock was located to the east of its namesake on the western side of Regent Road close to the point where it has its junction with Sandhills Lane. On the east side of the road was the Sandon & Canada Goods Station of the Midland Railway which had opened on 2 June 1873. The LOR ran within the dock estate at Huskisson behind a large stone wall. Access to the station for the public was via a doorway cut into the wall at each end of the station. Beyond the doorways there were steps that led up to the platforms. 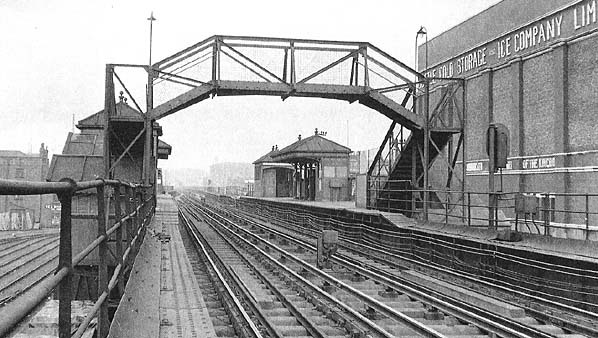 Both platforms had shelters and there was a footbridge at the south end of the station. At the time of opening the station was served by a high frequency service in each direction running every few minutes between Herculaneum Dock and Seaforth Sands. On 21 December 1896 trains began running over a southern extension through a tunnel to Dingle which became the southern terminus. On 2 July 1905 a further extension opened from Seaforth Sands to Seaforth & Litherland and, from that date, most northbound services ran through to the latter. Some services did still terminate at Seaforth Sands. Seaforth & Litherland was located on the Lancashire & Yorkshire Railway’s (LYR) Liverpool and Southport line which had been electrically operated since 22 March 1904. The LYR and the LOR had aspirations for through running. The LOR had electrified the line using a live rail placed in the centre of the running rails whilst the LYR had used a live rail placed to the side of the running rails. The LOR therefore altered its live rails putting them to the side of the running rails. A through service between Southport and Dingle which called at Huskisson Dock was introduced on 2 February 1906. It ran at hourly intervals in each direction, and the LYR had built special lightweight rolling stock that was capable of using the LOR line. In summer 1906 the LYR also introduced a service between Dingle and Aintree. The Aintree service was even increased to a half hourly frequency in each direction but it was not a success and was withdrawn in 1908. For horse race meetings at Aintree services were still operated from Dingle. The LYR withdrew the Southport service in August 1914 as it had never lived up to expectations. Through tickets from Huskisson Dock station to Southport (and other destinations on the LYR) were still offered as passengers could easily change trains at Seaforth & Litherland. During the Great War the LOR performed a vital role as Liverpool was the major westward facing seaport. By the 1920s millions of passengers every year were using the LOR. From the start the LOR had realised the tourist potential of the line as it had excellent views of the docks and the waterfront. Posters advertised the scenic aspect of the line and special tickets were issued allowing a day’s unlimited travel for a fixed price. The outbreak of the Second World War on 3 September 1939 resulted in the last Aintree race meeting being held in the spring of 1940. Between December 1940 and January 1942 Liverpool was bombed by the German Luftwaffe, the worst period being between December 1940 and May 1941. The LOR received a number of direct hits but, being vital to the smooth running of the docks, it was patched up and services were restored as quickly as possible. After the war there was a boom in trade coming through the Liverpool Docks, and the LOR was busier than ever. Aintree race day services resumed on 29 March 1947, the Grand National having been moved from a Friday to a Saturday. On 1 January 1948 most of the railways of Great Britain were nationalised, but the LOR remained independent. For the Grand National on 26 March 1955 the LOR ran nine trains from Huskisson Dock to Aintree Sefton Arms all of which originated at Dingle; there were seven return workings which ran on to Dingle. For most its length the LOR ran directly above the Mersey Docks & Harbour Board railway which had been steam-worked from the late nineteenth century; it was originally worked by horses. In 1955 an engineering inspection of the LOR structure showed that extensive damage had occurred over the years and in places it was seriously corroded. Despite having a healthy revenue the LOR did not have the finance to undertake the repairs. There was much discussion, including talks with the city council about a municipal takeover, but nothing could be agreed. As no rescue package could be agreed the LOR decided upon complete closure and, despite a great deal of local protest, the last trains ran on 30 December 1956 and Huskisson Dock closed completely on Monday 31 December 1956. That day a staff train was run from Dingle to Seaforth Sands; a further service departed in the afternoon. Over the coming weeks trains were transferred from the southern end of the line to Seaforth Sands. On 23 September 1957 demolition began, and the overhead structure was taken down; the process was complete by January 1958. The Dockers Umbrella - A History of the Liverpool Overhead Railway - Paul Bolger - The Bluecoat Press 1992. Huskisson Dock station looking north in the 1930's. Huskisson Dock LOR station shown on a 1:2,500 scale map from 1906. The north end of the Sandon & Canada Dock Goods station can be seen to the right. The Huskisson Dock LOR station shown on a six-inch scale map from 1910. Huskisson Dock LOR station shown on a 1930s street map. 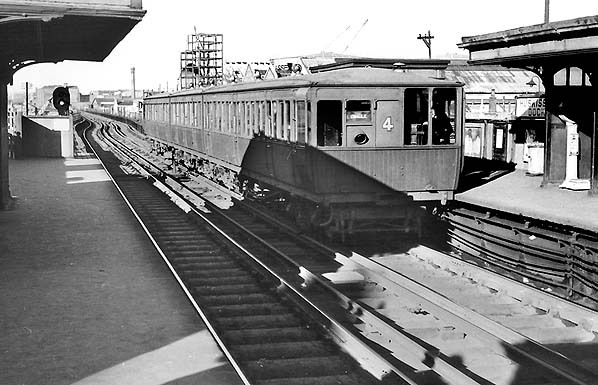 Looking west from the up platform at Huskisson Dock station in 1930. 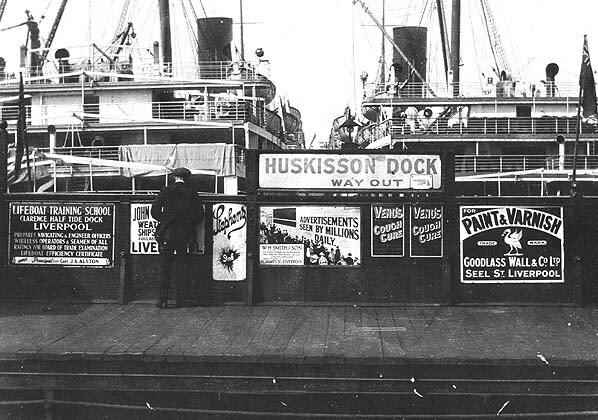 Two ships are berthed in Huskisson dock and an array of adverts can be seen on the down platform. 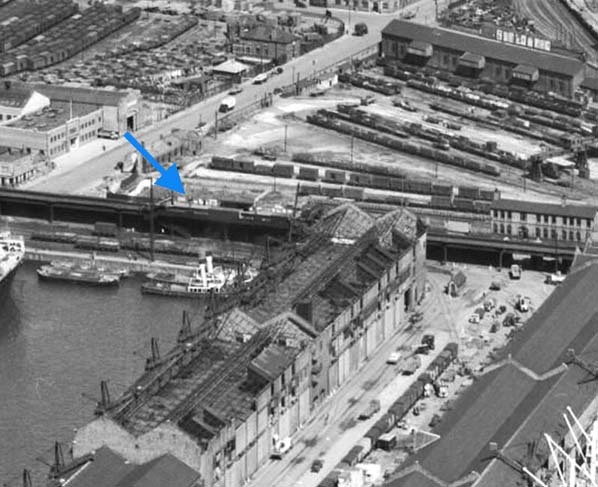 A view of Huskisson Dock LOR station seen from the air in 1949. Huskisson dock is seen to the left. Looking north at Huskisson Dock LOR station on 10 April 1955 as a three-car refurbished set departs for Seaforth & Litherland. The proximity of the docks to the line is clearly illustrated. 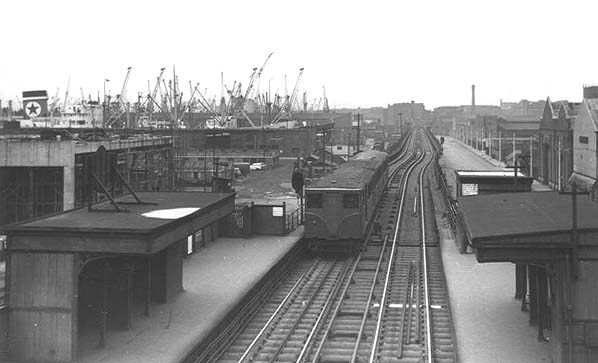 Huskisson Dock station looking north from the down platform in October 1956. 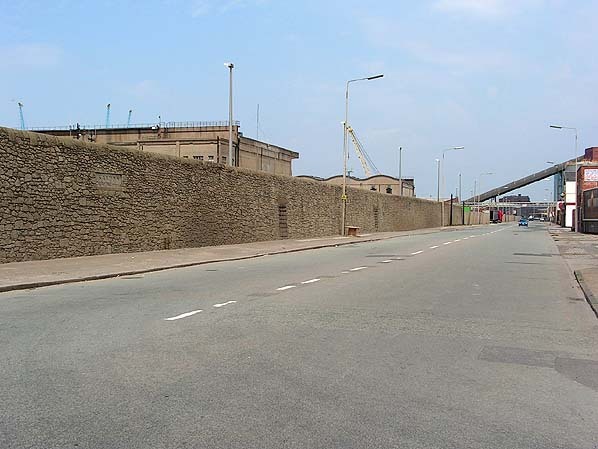 The site of Huskisson Dock station in June 2005 seen looking north from the opposite side of Regent Road. Note the bricked up doorways which provided access to the station through the dock wall.